A day after the whizzy and fizzy Aylesbury Festival (read about it here! ), we took a stroll down the colourful Cowley Road on a beatifully sunny (and very hot!) Sunday. The traditional carnival is the biggest yearly event in Oxford, bringing together the lives and cultures of East Oxford. 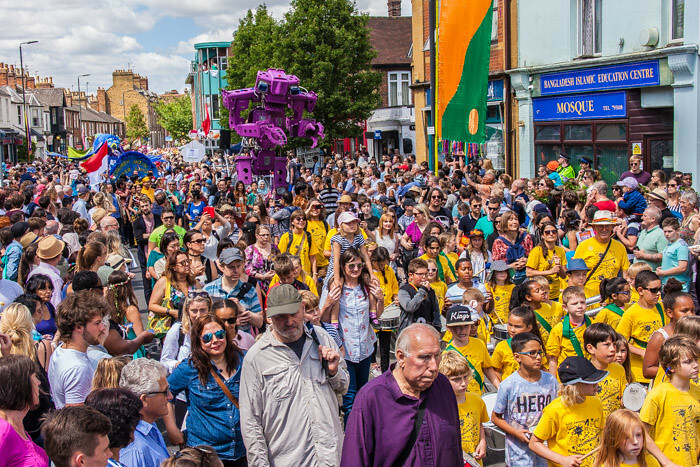 A parade, led by the awesome purple robot Colossus, several music and dance stages, stands and ferris wheels were just some of plenty of fun things happening that day in Cowley. We were very happy that some of our friends from a fellow group Maracatu Estrela do Norte from London joined us and bump up our numbers! After the parade and and duet with Oxford’s own Horns of Plenty, we had a short set at a music stage and concluded the day at the Global Dance Stage – which wasn’t just the stage after the audience bravely joined our large ciranda for a wonderful final dance of the day. Our youngest fan and future member of our band– whoever you are, little girl, Sol Samba awaits you! After this weekend, Sol Samba is taking a well deserved summer break. We will be back at the end of the summer and will start a new season of rehearsals in September. Follow our Upcoming gigs page to see when we perform next. Or – why wouldn’t you join the band? Contact us to find out information on when we start again. 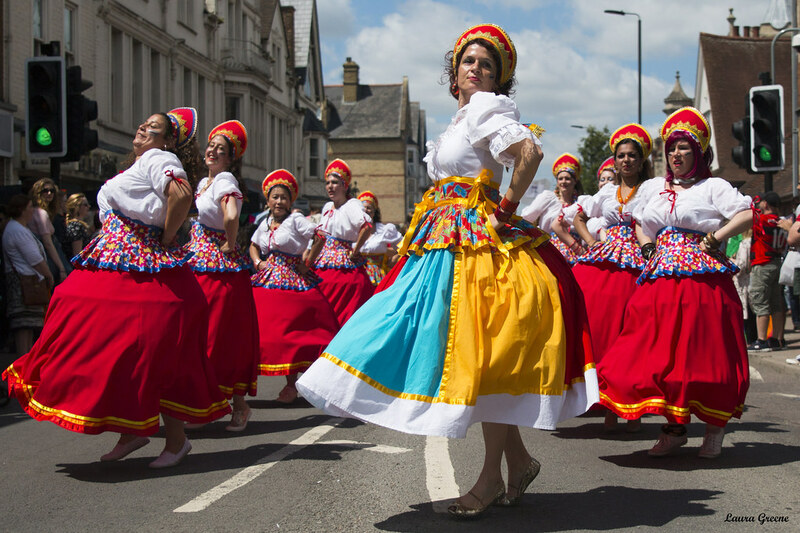 You could be parading down Cowley Road alongside us next year! Like every year in the beginning of July, this Saturday morning Aylesbury was again flourishing in colours, music and energy. Traditionally a Roald Dahl festival renamed itself into the Whizzfizzing festival this year, and the whizz and the fizz were bursting out of every pore of this lovely town. The theme was »Fantastical creatures«, so Sol Samba put on our best horns and our dragonly dancers led the 30+ groups parade through the town centre. In the main square, we later danced to the rhythms of the always fantastic Toque Tambor, as well as to the catchy sounds of the Rajasthan Heritage Brass Band, an amazing band that had flown in from Rajasthan specifically for this event. A dragon-ish ROAR to everyone who was in Aylesbury! On Friday, June 23rd, we entertained at the Trinity College commemoration ball in the centre of Oxford. The event, attended by hundreds of students celebrating the end of term, followed the theme “Belle Epoque”, an homage to the Golden Age of art, elegance and innovation. Sol Samba brought a spirit of Northern Brazil in the 1920’s themed event with infectious rhythms of Maracatu – we were happy to see students joining us in a large ciranda dance. The evening continued with beautiful fireworks and diverse concerts, and ended in the late hours of Saturday morning. In the hottest weekend this year, Sol Samba brought additional rays of sunshine and summer to three very different, but all fantastic, events. Ramsden’s Tandem Festival, dubbed county’s “most innovative music festival” by OxfordMail, hosted us on Friday, the 16th of June. The eco-friendly festival took part in the Lower farm, surrounded by woods; stages were located within stalls, barns and silos, as well as in woods and fields. From fires in the quarry, yoga in the zen circle, to poetry reading in the barn, decorated with hundreds of origami-like folded books and resting in a tub in the “living room”, this festival was a perfect way to relax after a long week. 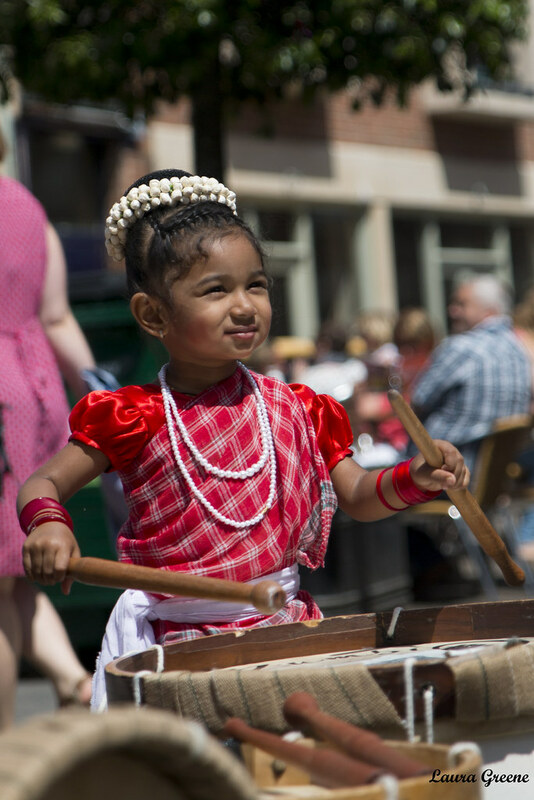 On Saturday, 17th of June, Slough town centre became the stage for Streets Alive – a surprising day of silliness, sounds and spectacle with pop-up performances to delight adults and children alike. Spread over three locations and throughout the day, Sol Samba joined various other performers in dance and song. Our visit of Slough ended on a high note with a lovely ciranda (Brazilian circular dance), led by a large number of brave children! Saturday ended in North Leigh – for its 10th anniversary, Nor Lye 10 expanded its festival area to two stages with plenty of high quality music and beer and entertained a large amount of visitors. Many joined our dancers and moved to our beats. Well done, everyone! This beautiful bank holiday weekend Sol Samba tagged along with some amazing other acts, such as Sean Paul, Pete Tong, Groove Armada, Rag’n’Bone, Amy Macdonalds, and others to entertain at the Common People festival in the South Park in Oxford. A full weekend festival of music, street food, and diverse arts and activities saw a large crowd of over 20,000 visitors on Saturday alone. We enjoyed two gorgeous days of sunshine and promise of summer in the air, as we played three sets, joined the always fun Horns of Plenty for a drum-and-brass rendition of Iko Iko, led a dance workshop with excited visitors, and snapped a photo with friendly policemen and a police dog along the way. We certainly had fun and we hope to see everyone again at Common People 2018! Cowley Road Carnival and BBC Oxford both joined the party and took a swirl with us! On Saturday, the 20th of May, we performed at the Oxford Mela – the beautiful and colourful event organized by the Oxford Hindu Temple under the motto “Celebrating Diversity in Oxford”. With a combination of great performances (ranging from Bollywood dancing and drum workshops to fashion shows and brass music), good food, and interesting stands we banished the rain and (hopefully) bring the first taste of summer to Oxford. The weather forecast held up and the May Morning parade turned out successfully. Setting off shortly after the choir has finished singing at the top of Magdalen College tower, we paraded up the High and jammed with Horns of Plenty and the audience to the classic “Iko Iko” along the way. While the morning sun was blasting, the crowd joined us in a large ciranda (a typical Brazilian dance) for a fantastic finale! First part of the video: performance. Second part of the video (starting at 6:00): ciranda dance with the crowd. The lovely Donnington Doorstep organized a music event to help raising funds for the organization. It was an event filled with nice energy, good music and great food!